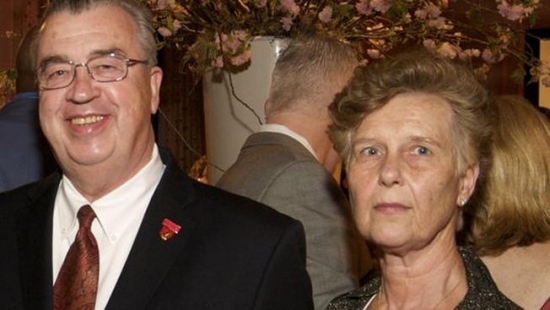 Prosecutors in Somerset County, NJ, have issued their final report surrounding the mysterious deaths of a high-profile hospital CEO and his wife last fall. They have ruled that 72-year-old John Sheridan Jr. stabbed his wife of 47 years, 69-year-old Joyce Sheridan, before setting their bedroom on fire and committing suicide. John died of sharp force injuries and smoke inhalation. They were both found unresponsive inside their burning home on September 28th of last year. John was the CEO of Cooper University Health System. The couple's four sons are rejecting the prosecutors' report and plan to file a lawsuit challenging their conclusions. Click Here to Read the Full Prosecutor's Report. See below for the family's response. A 4-year-old girl was found standing on a street corner all alone in the Tacony section of Northeast Philadelphia early Friday morning after she ventured out into the rainy night looking for a frozen treat from the convenience store. A concerned man found the little girl standing there soaking wet on the corner of Torresdale Ave. and Magee Ave. around 3 a.m. and flagged down the Route 56 SEPTA bus. As they waited for police to arrive, little Annabelle told everyone how she dressed herself, unlocked the door and went out because she wanted a slushie. She was taken to St. Christopher's and reunited with her parents. Philadelphia Police are investigating after the body of a man was discovered in the Schuylkill River this afternoon in Fairmount Park. The discovery was made around 4:00 pm. The body was found on the 3900 block of Kelly Drive near the Roosevelt Boulevard Extension in East Falls. At this point the only information is that it is of a white male. The Marine Unit recovered the body and the Medical Examiner's office will perform an autopsy to determine cause of death. “From the outset we have said that no one wants answers about our parents’ deaths more than we do. The conclusion announced today fails to provide those answers. It is nothing more than an expedient way for the Prosecutor’s Office to close its file and put an end to its embarrassing bungling of this murder investigation in the hope that our family, the citizens of Somerset County and the press will stop inquiring about what actually happened. The family will have more to say in the coming days and weeks, but for today, asks that the press respect their privacy as they continue to deal with the loss of their parents. • Our father was stabbed five times including one wound that cut his jugular vein in addition to suffering five broken ribs and a chipped front tooth. Despite initial reports from investigators that all of his wounds were very shallow and caused no significant injuries, at least two of his stab wounds were found to be inches deep and were caused by a knife that has not been recovered. Moreover, one of those wounds cut his jugular vein. If this is a murder-suicide; where is that knife and why was it not recovered at the scene after multiple searches? • Dr. Baden identified the deepest of the stab wounds to our father, the cut to his jugular and the existence of a third knife with a blade that is much narrower than those that were recovered in the bedroom. Only after Dr. Baden’s autopsy did investigators acknowledge the existence of a third knife and the severity of his injuries. In fact, it was only after Dr. Baden’s autopsy that investigators re-took the crime scene to search for the weapon used to stab our father. How were the wounds identified by Dr. Baden and the existence of that knife not identified in the initial autopsy/investigation thus requiring the investigators to perform a second search of the house a week after our parents were murdered? If investigators claim to have known about the third knife, then why was it necessary to re-take the house and perform a second search for that weapon? • Four doors to the house were unlocked and blood is evident upstairs and downstairs in the house. Why did investigators not dust for fingerprints anywhere in the house and why did they not search for trace blood evidence outside of the bedroom or examine any of the blood outside the bedroom? • Two knives were recovered at the scene – in addition to the knife that is missing – one used to kill our mother and a large bread knife that was unused. Why would anyone need three knives to commit a murder-suicide? Why would a third small (missing) knife be used to stab our father after a much larger knife was used to kill our mother? Again, where is the third-knife? • Investigators have told us that like the strong woman she was, our mother fought for her life and had numerous defensive wounds on her hands and arms. They have also told us that there are no scratch marks on our father and no blood transfer from our mother to our father. How is it possible that our mother fought so hard for her life yet failed to leave a single scratch mark on her supposed killer and none of her blood was transferred to his clothes? • A three foot wrought iron fire poker was found in the bedroom – a room without a fireplace – by insurance investigators a month after our parents died. Investigators from the Prosecutor’s Office photographed the fire poker in the bedroom on the day of the fire, but did not take it into evidence until the family demanded it be taken when found by insurance investigators. Why was this weapon ignored by investigators given our father’s broken ribs and the lack of a fireplace in the bedroom, and what was the fire poker doing in the bedroom? • Our father was found under an extremely heavy armoire. How did someone who supposedly committed suicide and had suffered multiple stab wounds and broken ribs end up under an armoire? • Investigators claim to have interviewed 183 people as part of their investigation. They had complete access to our parents’ medical records, phone records, emails and text messages. In spite of this, they have identified no motive for our father killing himself let alone his wife of 47 years. They concede there were no marital problems, no infidelity, no health problems, no financial problems and no drugs in our father’s system. There was no note and their lives on the day they died were like any other. They had a face time conversation with their disabled grandson at 5:00 pm and our father was sending work emails at 7:30 pm and preparing for a meeting at the hospital the next morning.